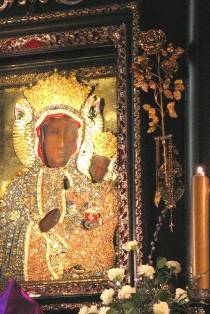 "I am all yours, Mary, my mother"
The Icon of the Pilgrim Virgin of Czestochowa continues to carry Her positive message that seeks mainly to defend life and family, especially after she was announced patroness of families throughout the world and to whom St. John Paul II had special devotion. 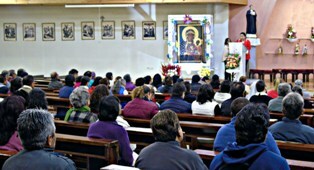 After visiting the Parrish Santa Maria de El Calzado, on Tuesday, September 25, the Icon arrived at the Parrish of San Ignacio de Loyola, in Solanda, south of the city of Quito. 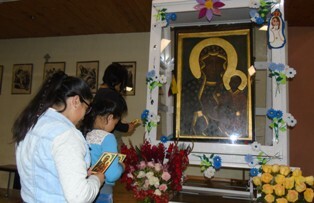 The Icon was received by the parish community with songs and prayers. The Holy Eucharist of welcome was celebrated by Fr. Denisse Yanangomez and assisted by deacon Patricio Fuentes, a cleric who told the parishioners briefly the story of the Icon: "History tells us that in the year of 1979 Pope John Paul II visited Jasna Gora, home of the Virgin of Czestochowa in Poland for three days, at the end of his visit, in an act of devotion he consecrated his country and all the present exclaiming: "I am all yours, Mary my mother", then offered a rose of gold that was placed on the main altar and said goodbye to the Mother of God". During his homily, Father Denisse Yanangomez commented: "We have accompanied our blessed mother the Virgin of Czestochowa tonight, and we welcome her with open arms, we are committed to defending her message of love and above all we will fight with impetus in defense of life". For his part, deacon Fuentes added that every day at 5:30 p.m., the Holy Rosary will be prayed to later participate in the Holy Eucharist, and invited the faithful and inhabitants of the surroundings to entrust to the Virgin every needs, spiritual and physical.